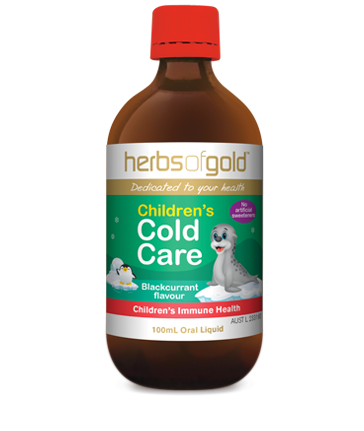 Herbs of Gold Childrens Cold Care provides a powerful blend of Elderberry, Olive Leaf extract and Echinace in an alcohol free glycerol base that is both safe and effective in treating colds, flu and mild upper respiratory tract infections in children. Echinacea is the quintessential herbal medicine when it comes to supporting the immune system. This herbal extract is typically regarded as an immune modulator, which indicates that it assists in regulating immune responses. With the addition of elderberry, to Herbs of Gold Childrens Cold Care, which has demonstrated to reduce the severity and duration of colds, this formula is a great all round immune supporter1. Herbs of Gold Childrens Cold Care may reduce the severity and duration of colds, flu and upper respiratory tract infections and reduce the risk of developing upper respiratory tract infections. Olive Leaf is a powerful all round herb that support a great deal more than the immune system. Research is indicating that Olive Leaf has antioxidant, anti-microbial and anti-viral effects2. This truly is a fantastic formulation from a company committed to providing exceptional products to support your health. For maximum benefit begin taking Herbs of Gold Cold Care immediately at the onset of symptoms. Children 9-12 years - Take 10ml twice daily. Children 5-8 years - Take 7.5ml twice daily. Chilren 2-4 years - Take 5ml twice daily.